I am embarrassed for having to take our time to even mention such a stupid product. 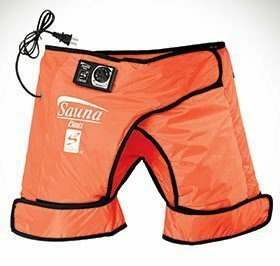 But since it has the word “sauna” in its name, we feel compelled to comment. Is the consumer this desperate, this unsure of themselves, that they think wearing a poly blend pair of shorts with a plug in heat coil system can actually offer any real benefit? Have used this product for 2 weeks. After re-hab from a devastating fall off a horse, this product was great! The heat feels so good and it did cause me to lose some excess weight I gained from in actvitiy. Don’t judge it until you try it. Lori may work in the Sauna Pant Customer Service Department.